Skype, more and more, is becoming a memory dump for me. My Co-workers post quick how-to do this or that into chat rooms, resulting in Skype becoming a repository of information. It's all there for the asking, but Skype's search is really lacking!!! 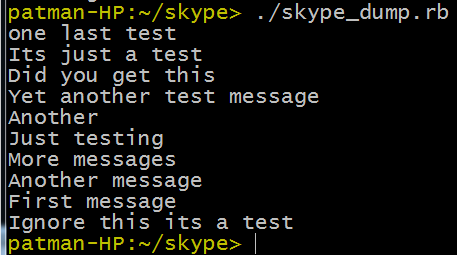 My first go at this is to just dump all the messages into a text file, so I can at least grep it. This document is going to cover creating a simple script to dump the data to a text file. To install run the following command. Here is the simple script. Replace the username and skype_username with your own. abort "Exiting, Can't determine if OSX or Windows"
stmt = db.prepare "SELECT body_xml from messages order by id DESC limit 10"
It successfully displayed the last 10 messages that were skyped to me! Here is the SQL query I came up with to get this data. > grep -nI ":::Vince" dump.txt | grep -i "ios"
This returns the message from a user named Vince where he mentioned ios. It’s not a perfect solution but at least gives me a file I can grep through. Hope this helps someone.